Nowadays, it is very hard to find a home without a wall-clock. More people are getting interested in hanging customized wall-clocks in their offices and houses. Need to turn the look of your house with an acrylic red butterfly clock? Petcarl decor is a place where you can buy decorative clocks at affordable prices. We have a collection of classy, cheap and beautiful house and office wall clocks for sale. You can give your office or house a new look with our quality and classy wall clock. 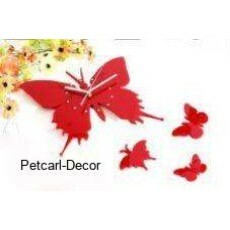 Our acrylic red butterfly clock comes with three different sized butterflies to allow you to create your own unique and decorative layout on the wall. You can also buy the acrylic red butterfly clock to give to someone as a gift. A part from offering decorative wall clocks, we also offer other interior décor products such as hidden cameras, digital calendars, wall papers, shelves, wall stickers and office accessories among other products.